One of the most popular online casinos that serves the Australian gambling public has won a new coveted award. BitStarz Casino won the highly regarded Players' Choice prize at the AskGamblers Awards recently. 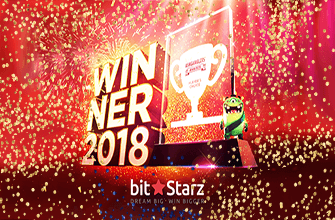 BitStarz Casino was proud to announce this addition it its growing collection of prizes and thanked its players who turned out in big numbers to vote for the site. According to BitStarz Casino, AskGamblers has always been one of the most well-respected casino platforms in the world. "Only the cream of the crop makes it to the awards stage each year, notes the online casino, adding that BitStarz beat 1,300 other casinos to get its hands on one of the most truly coveted awards in the industry; the Players' Choice award. There are many reasons why players backed this online casino, but most importantly because the site combines the personal and quality service of a small establishment with the game selection, rewards, free spins and bonuses of a large operator. According to the online casino, the games, bonuses and other incentives don't fall short in creating one of the most exciting experiences around. In addition, the sites customer support team is accessible through live chat and email 24/7. "Pushing us over the top, we're smashing records with our 10-minute cash outs," said BitStarz Casino. Players who haven't had the opportunity to open an account and play at BitStarz Casino yet, are welcome to do so today to find out what all the hype is about. Here you will find a very generous welcome bonus, spread over your first two deposits. When you make your second deposit at BitStarz Casino, you will receive a 50% bonus up to $100 or 1 BTC credited instantly to your account.